There’s no shortage of things to do for children at Glastonbury. The Kidzfield is a huge kids’ festival within the Festival featuring top names from the world of children’s entertainment and loads of activities – from a knee trembling helter skelter to colourful softplay – for kids of all ages. Click here for more information. The Green Kids Area – situated in the Green Fields – offers adventures on climbing walls and wooden ships as well as alternative entertainment and activities. In the Theatre and Circus Fields, there are lots of workshops welcoming children and many morning shows will tickle their fancies. Children aged 12 and under are admitted free when accompanied by a ticket-holding adult. It’s worth bringing some ID if they look older than 12. Everyone aged 13 or over on Wednesday 26th June 2019 (when the Festival starts) planning to come to the Festival, must have registered and bought a full ticket. Children aged 12 and under do not require tickets and do not need to register. Anyone under the age of 16 wishing to attend the festival MUST be accompanied by someone over the age of 18. Those who are ages 16 or 17 are allowed to attend the festival unaccompanied, but we would strongly advise that this decision is made with the consent of a parent or legal guardian. There are two Family Camping Fields: the Cockmill Meadow near the Kidzfield and one on the north-west of the site at Wicket Ground. Families do not need a special ticket to camp in the Family fields, but it is not possible to reserve space in advance (and they can fill up quickly). 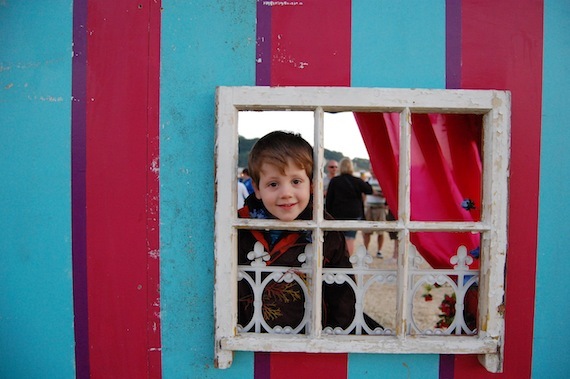 Click for tips from the mother of a toddler on bringing kids to Glastonbury. Bring plenty of sunscreen and waterproofs – and don’t forget a sunhat. A nice, strong but snuggly rug/blanket is essential. It’s great to sit on during the day and great to wrap them up in during the evening, as is plastic sheet to sit on if it gets wet. A wheelbarrow, off-road pushchair, bike trailer buggy or other form of push/pull impromptu transportation for young children is useful. Not only can it help you cart about all that you need to cater for every child-related eventuality, it will also relieve those inevitably tired little legs. The Festival site is massive, kids will get tired and unless you are happy to carry them for a long time, you’ll need some transport. Avoid a trek to the toilets in the dead of the night by bringing a bucket with a tight fitting lid (you may find it useful too!). A first aid kit (with Savlon, plasters, waspese, midge repellant, Calpol, etc) is essential. There are quieter, less crowded family camping areas for those with young children. See the camping pages for more information. Big crowds can be daunting for children, to avoid separating from them, give your kids the same advice you would if you were anywhere else: don’t go off with strangers or anyone without telling you first. If they get lost, have them ask for help from a security steward or policeman, any Festival staff with a radio, another adult with children, or one of the Information Points or market gates. It’s really helpful if children have their parent’s mobile number on them – write it in marker pen on your child’s arm, so we can contact you, but not their name. If you don’t have a phone just the name of the field you are camped in is helpful. From a practical perspective, it can help to dress your children in bright colours or even a child’s hi-vis vest, as it will help them stand out in the crowds. If you lose your children ask for advice at any Information Point, or from any Festival official. Found kids are looked after at the Kidzdfield until 8pm. They are then taken to Wagonshed Welfare, by the Farmhouse. There are no creche facilities at the Festival. You should make arrangements within your group of friends and partners for someone to be supervising your children at all times, even in the Kidzfield. The Kidzfield is one of the nicest fields on the festival site – make sure all you big kidz take a few minutes to appreciate it too.